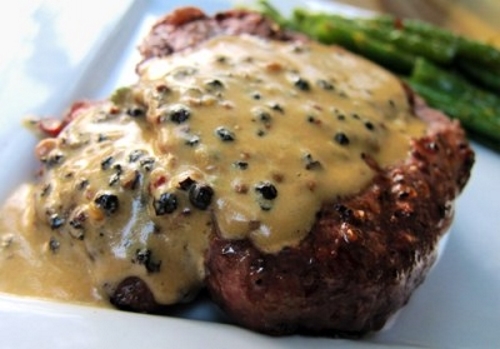 Filet mignon with brandy, cream and peppercorns is most delicious. I found this recipe in an old 1981 HP book on Northern Italian Cooking by Biba Caggiano. It looked and sounded so delicious I couldn't pass up putting it on my site. I'm definitely going to try this one soon. Chef Caggiano is owner of "Biba Restaurant" in Sacramento, California. She states that this "Filetto con Brandy, Crema e Pepe Verdi" recipe is from the Bacco Restaurant in Bologna. Filet has always been my favorite. Let's try this recipe and let me know what you think. In a small bowl, combine ketchup, mustard, Worchstershire sauce and green peppercorns. Melt butter with oil in a large skillet. Add filets and cook for about 2 minutes on each side. Remove filets and set aside. Add brandy and deglaze skillet by stirring the bottom of the pan. Add ketchup-mustard mixture and cream, mix well. Season with salt and cook to desired doneness. Plate and spoon over sauce.